“Regardless of race, language or religion…” This phrase in Singapore’s National Pledge has been a cornerstone of the city-state’s approach to racial harmony. The principles behind this policy are already unraveling, with Singaporeans becoming increasingly intolerant of foreign races, languages and religions. 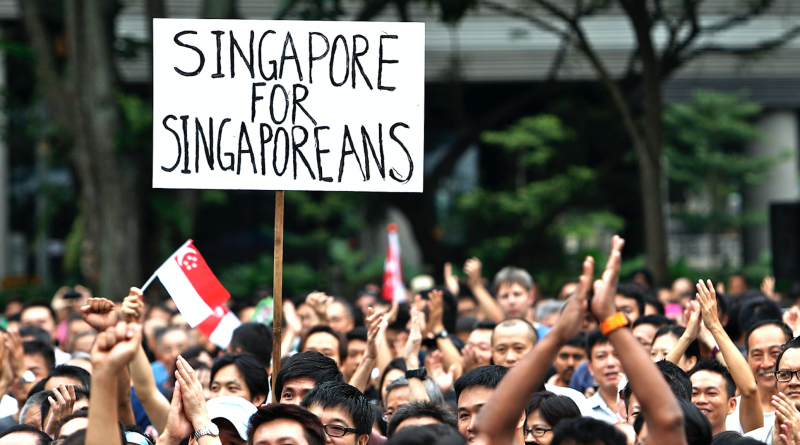 This “citizen-foreigner divide” may undermine racial harmony in Singapore if left unchecked. The government’s own harsh treatment of refugees, however, sets the tone towards an even more intolerant Singapore. Historical racial tensions led the Singapore government to implement long-running policies to encourage racial integration. Ethnic enclaves were broken up and quotas implemented in public housing to prevent racial segregation. A strong push was also made through public education and campaigns to promote racial harmony. This approach appeared successful and Singapore seemed free of the simmering racial tensions brewing in other countries. Given this success, one might have assumed that Singaporeans have been imbued with universal principles of tolerance and respect for all races. This should have meant that Singaporeans would extend these principles to foreigners, and treat them with respect and sympathy. This has not been the case. Xenophobic nationalism has been rising, with a mounting hostility against immigration and foreign workers. Prime Minister Lee Hsien Loong noted in 2012 that he was “worried by… the nasty views which are expressed” and that this “reflect badly on us and damage our international reputation – people think that Singapore is anti-foreigner and xenophobic.” This hostility has not been limited to the online sphere. Any moves towards integrating foreign workers into society, such as the building of workers’ dormitories in the heartlands, have been roundly rejected by residents. NGOs such as TWC2 and HOME have cited growing cases of abuse of foreign workers, typified by the blatant assault of a foreign construction worker by 18 year old Daryl Lim. This culminated in immigration becoming a critical issue for the 2011 General Elections and the creation of the “Singaporeans First” political party contesting in the 2015 General Elections. Do these developments mean that Singaporeans are not following the government’s cues to embrace all races, religions and cultures? If so, this is remarkable for a population that has generally accepted the state’s position on socio-economic issues. It is possible, however, that the government’s own hostility to foreigners may have contributed to this social mindset. The recent plight of Rohingya refugees being denied shelter in Singapore has brought the government’s stance on foreigners into stark relief. Singapore has steadfastly refused to accept refugees, with the Ministry of Home Affairs stating that it is “a small country with limited land” and that the government has been against accepting refugees for decades. Indeed, Singapore is not even a signatory to the 1951 United Nations Convention relating to the Status of Refugees. These justifications make no sense when considering that between 1975 and 1996, Singapore hosted some 32,000 Vietnamese refugees who had fled due to the Vietnam War, with hardly any impact on Singapore’s economic development. Furthermore, the continued flow of migrants into Singapore suggests that the lack of space was not a major obstacle. Rather, it was the refugees’ inability to contribute to our economy which appears to doom them to drifting in the seas. The state then sets the precedent of viewing individuals through a lens of economic utility, rather than through universal principles of equality. This undermines the principles of the 2012 ASEAN Human Rights Declaration and also undercuts the principles of universal respect and dignity underlining its racial harmony policies. It is not surprising that the population will follow the state’s approach in viewing foreigners through a utilitarian economic perspective and reacting with hostility when its own interests appear to be hurt. Indeed, a 2012 Straits Times poll suggests that Singaporean’s anti-foreigner views are not driven by racism. Rather, the prevailing concerns were over employment, with 60% of respondents believing that foreigners stole citizens’ jobs. This is peculiar, given Singapore’s traditionally low unemployment rate at 2% but not surprising given the state’s legitimization of racial hostility on the basis of economic issues. This is a dangerous trend. If it continues, various races in Singapore can also view each other through the lens of utility instead of universal brotherhood. It now sets the tone that one must be the “correct” type of Chinese, Muslim or Indian before being embraced as an equal. In 1978, Lee Kuan Yew explained that refugees cannot be accepted and that one had to “grow callouses on your heart or you just bleed to death.” To truly create racial harmony, the universal principle that all races and creeds are equal has to be established. The state must lead the way, with the acceptance of refugees and the proper treatment of all individuals regardless of their economic viability. Our callouses are hard now and our hearts are made of stone. It is truly time for Singapore to have a change of heart on how we treat others, for it will guide the way that we treat our own. Sam Myat San is a professional debate and oratory coach. He graduated from Harvard University with a degree in Government and previously worked for the Ministries of Defence, Foreign Affairs and Law.